INSTANTLY while in a fully conscious state. Why are brain waves important to healing? 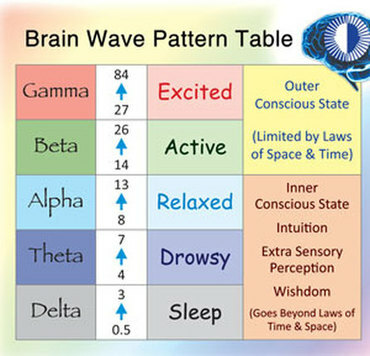 Recent scientific studies through EEG's have found that the emotions for peacefulness and internal bliss are only experienced when theta brain waves are most active in the brain. This Theta brain wave state allows individuals to access their subconscious mind, where beliefs are stored and experience their strongest spiritual and healing connection. Increased conscious awareness and perception. 28- 100 cycles a second. Very deep relaxed state of mind. Sleep, deep meditation or hypnosis. 4-7 cycles per second while in Theta. The Theta Healing Technique allows instant connection with the theta brainwave and to Source Energy / Creator of All That Is. When we access this state the co-creation major change is possible in your life at the deepest subconscious levels. This happens by consciously (Beta) accessing the subconscious (Theta) brain wave, one is able to apply increased learning (Gamma) to re-write the old programmes of your subconscious (Theta) into new positive ones, allowing them to flow (Alpha) into your present and conscious mind (Beta) to change or resolve the limiting beliefs that have been blocking happiness, health and abundance.